If you ever visit Osaka, be sure to try one of its most famous dishes, "kushikatsu" (串カツ). Typically, it's fried pork on skewers. One restaurant's menu is anything but typical. The place to go for good kushikatsu (also called "kushiage" or 串揚げ) is Shinsekai. The neighborhood is rather rundown, and it's hardly the nice part of town. However, the food is delicious. Kushiage is usually made with pork, chicken, beef, vegetables, cheese, etc. They're breaded and deep fried and served on sticks. You dip the kushiage in a sauce that's kind of like Worcester sauce. Since the sauce is often in a big, communal vat on the table, it's important not to double dip after you've taken a bite. Don't do that! In the heart of Shinsekai, restaurant Kushikatsu Jan Jan serves up your standard deep-fried fare. It also has a most special "challenge kushi" menu that offers some slightly different eats. There is kushi-kangaroo, kushi-ostrich, kushi-alligator, and kushi-frog. Granted, in the world of adventurous eating, these are pretty tame, but for Japanese, these meats are quite exotic (meanwhile, in Japan, horse and whale meat are much more common). 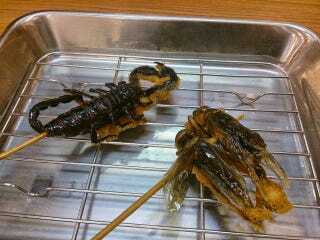 One cricket kebab is 300 yen (US$2.88), while a skewered scorpion is 500 yen ($4.79). If you visit Kushikatsu Jan Jan and want to try the crickets, they are called "koorogi" (コオロギ) in Japanese. For scorpions, ask for "sasori" (サソリ). More traditional meats, like beef and chicken, are much cheaper, costing between 100 yen ($.96) and 150 yen ($1.44) per skewer. GAH. It's like they censored the wrong part. Last year, I ate at Kushikatsu Jan Jan with my family. It might not be the best kushiage restaurant in Osaka, but it is quite tasty—especially the more standard menu. I didn't order scorpion or crickets, but a salaryman at the table next to us did. When I asked him how they tasted, he said they were pretty good.